Meet Glory and Everett Hutchins. Maybe you’ve already met them. They live in a neighborhood very much like yours, except they have a little secret. Everett (Jude Ciccolella) and Glory (Susan Priver) are active cannibals. Not exactly a Main Street practice today. And their lifestyle presents some practical challenges: like how do you get those necessary provisions? Meet Richard Reubens. Perhaps you’ve met him too. A mid-level Wall Street investment specialist, Richard (Ross McCall) was transferred to the LA offices under some murky circumstances. In LA everyone needs a car. When Richard answers an ad selling a vintage Mustang, he unwittingly winds up Glory and Everett’s captive in their secret room, in their nice house, in the neighborhood that looks like your neighborhood. And Richard is fated to be the next addition to their unorthodox menu. However, Richard is not a silent lamb about to be led willingly to his own slaughter. Perceiving Glory as the ‘weak link’, Richard uses all his Wall Street persuasiveness to break her – creating twists and turns that expose surprising personality traits in Glory which constantly thwart his plans and keep us guessing how it all will end. 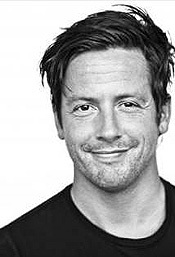 Starring Ross McCall, born in Port Glasgow, Scotland he is most noted for his role as T-5 Joseph Liebgott in the 2001 HBO miniseries Band of Brothers, as Kenny Battaglia in the television series, Crash, on the Starz network, and most recently as Matthew Keller on USA Network's White Collar. Chatting recently with Ross McCall himself, I paid comment to the fact that his role in 'Serving Up Richard' was just so compelling. And that speed bump after speed bump that he encounters we're there alongside him for the ride - until the very end! "Yeah, they went for the suspense there where you're pulling your hair out by the end of the movie," he laughs. And it certainly doesn't have a Hollywood ending, which I also liked! "It's certainly not a Hollywood ending," he again laughs. "In fact that was one of the reasons I was kind of compelled to do the film. Because it wasn't your typical Hollywood ending. Without giving too much away, it's one of those things that I love the fact that he doesn't get away scott free. That it doesn't all turn out a bunch of roses for him. But what's interesting for me is that I'm stuck in a room for the entire movie. There wasn't much in the way of me stretching my legs throughout the shoot. We were on a soundstage in LA and that's kind of where I stayed for a month. So I kinda felt like a prisoner of the set anyway in some places." What kind of an undertaking did you afford yourself prior to filming the endless caged scenes? Like, did you have someone feed you food through bars at your own house, perhaps?! "You should ask my missus, she would probably say yeah," he laughs. "You know, I've always been cautious of the method that people talk about. I understand if you're playing a cowboy and you need to understand what the South was like, I get that. You gotta live and breathe that. But, if I'm gonna play a heroin addict I'm probably not gonna jack up some brown stuff in me. I'm probably just gonna rely on figuring it out ahead of time, which is what I did on this." Sadly, Serving Up Richard is the kind of tale that could actually ring true in real life! "Yeah, and another reason I wanted to do the movie was I read an article seven or eight years ago of something very similar happening to somebody in Germany. He also answered a personal ad in the paper and got involved in all sorts of crazy things. So yeah, you're right, it ain't far off the mark at all." And so the moral to this story is ...? "Just make sure you bring a friend when you go look at a classic car," he laughs. As it has been some two years since you filmed it, is it weird for you to talk about it today? "It can be. When you get a phone call from a publicist or various different shows, yeah. But you got to remember the producers and what-not are still in the midst of that particular project. So yeah, it's not that the excitement isn't there, you just have to do some research the night before and get it back into your brain. So no, it's not too much of a stretch." The movie took a month to film, cost just $400,000, and had you locked in a cage for 95% of it. So, what was the most heartfelt moment for you within your portrayal of Richard? "Oh, wow, I can only imagine what he was feeling. But the most heartfelt moment was when it turns and he has to get involved in the murky business. When something is dropped off in his room and he has to dispose of it accordingly. I think that must be for any human being a trail and a test of character. Not only has he been asked to do something extremely inhumane and unnatural to his world, but he also knows he has no choice. So, and as much as I joked about it earlier, it's kind of true that when you're stuck on a soundstage for up to 14 hours a day it starts to become you." "I did an awful lot of night shoots on this too. So there were many times when we were going into the night. For some reason they thought that would work, to get everyone into a mental state, I think. So you're suffering from your own exhaustion and not seeing much of the daylight. And all the time dealing with such a dark subject matter. It all kind of plays its part. And I think that part in particular for me was the moment when it hit me and I thought, 'Jesus Christ, this is terrible,' you know. It was just a horrible position for him to have been put in." Following on from that, your co-star Jude Ciccolella, who played the anthropologist Everett Hutchins was simply terrifying in his role. So was there ever a moment during filming that you got lost in your role and he brought you screaming back to life with his acting, so to speak? "Obviously when you're trying to work in a scene with another actor who's always on their toes, as Jude is. But I actually go the other way - I get excited by it. I'm kind of excited that I get to play with somebody. And obviously I'm not aware of that at the time, but there were definitely times that he would keep me on my toes and vice versa. I think that's the joy of the filmmaking process when people can go toe to toe with you." Stepping back from the film process, watching it like us, are there other ways you think Richard could have either signaled for help or gotten out within the confines of the living room, perhaps? "I mean, yes and no. Listen man, it's like a hostage situation. If you're locked in somewhere it's all very well in hindsight, and being outside of the situation, saying you could have yelled a little louder, or punched the hole a little bigger. And bear in mind we are still dealing with a movie." "So yeah, there are probably things that you and I could look at now and say yes, he could have done that, and he could have signaled the gardener who was doing the yard that morning. But the truth is, for the suspense of the movie and also for real life, you put one foot wrong in this kind of situation and you can be in all sorts of trouble. Especially when your own strength doesn't really come into it. Caged and unguarded is definitely still a hard situation to get out of in any case." The film was originally entitled THE GUEST ROOM, so does the name change make any difference to you as an actor? "Not really. It kinda made a lot of sense to me anyway. But people have their rhymes and reasons for doing such things and I just go along with it, you know." Your character of Matthew Keller on White Collar is just brilliant. Beyond nasty, yet loveable I just want to see a whole show devoted to this character! "You know I'm very fortunate. They've been so kind to me, the writers. They give me nothing but juice, you know. And they have so much fun with it too. When Keller comes back into play I know it's a fun time for all of us. They get to write the ultimate bad guy and I get to play him. And it's a joy going to that set and hanging out with all the guys from the show. We always want to bring the game up and to bring something new and exciting. And for the fans of the show, when Keller shows up most of them realize something is about to happen. They always know the stakes have been raised. Yeah, it's an absolute joy. I have so much fun playing him." He is such a rogue, such a bad, bad man, and yet you just want him to get away! "Yeah, and he does - all the time," he laughs. "They keep coming up with these genius ways of somehow getting him away. I don't know how many times the poor guy has been shot now, but he keeps bouncing back." He was arrested in Season 3 of White Collar, sooooooo ... is he coming back in Season 4? "It's not the last you'll see of Keller," Ross answers slowly, overly cagey with every word. He will be causing mayhem and being a nuisance at some point soon." Have you actually filmed scenes for Season 4, or are we talking now Season 5?! "This is all to continue in season 5. But, you know, I'm a guest so when I go over it's their house, you know. So I wipe my shoes before I go in and I handle their baby with care and have a great time doing it. They will call you a couple of weeks in advance and ask if I'm free and available. And if I am we go and we play and that's how it works out. So you guys will probably know before I do. All we know is what future plans are being suggested ... and we'll leave it like that." Is Keller a role you can slide back into each time, no matter what other projects you've done in-between? "It doesn't really take me that long to be honest. Keller is someone I can kinda tap into pretty quickly," he laughs, "which is weird! So, not really. I think you've got to have a love for each character you play. I've played some dogs, as you know, like Kenny in Crash was a tough guy to love, but I did. I loved him. And I think that each person you play you have to have a sense of that to show the humanity of the character." "And so it's such a great kick for me that people like Keller. He's a bad guy but he's a likeable guy. And that makes me smile. And that's when you get that good moment in a character if you can find a love for them." Tell me more about the accent you've adopted over here in the US for your roles "It's a mixed breed," he laughs. "I was born in Scotland and raised just outside of London. So, I had a very thick Glaswegian accent up till the age of 9 or 10. And then for some unknown reason decided to try and sound like a Cockney from East London. And I did that for many, many years. And then, of course, I came to the States 12 years ago, after Band of Brothers. I've rarely played anybody from the UK. The last Brit accent was for Green Street, I think." "So, I pretend to be American half the time and I kind of adapted to life in America. Instead of saying petrol I'd say gas. Instead of saying football I'd say soccer. Which had all my fellow Brits saying 'how could you'," he laughs. "But the realistic point of view is that I wouldn't have to keep explaining myself every time I say a word so I might as well say the word that everybody understands." "And so with that comes this strange mix of New York, Boston, English mix of an accent. And yeah, I've no idea what it really is either," he laughs again. "I find myself at times literally listening to myself and going 'really, that's how you sound? That's the strangest thing in the world!' I guess I'm just more comfortable now. The only time I really hear myself is on TV or in a movie and I sound very East Coast. So that's where it is for me, I guess." But your specific vocal tone is instantly recognizable - like you may not know the name, but you KNOW the voice! "I actually get that a lot with people that want to stop and say hi. Either they'll come straight over and they'll know me from some particular show they're a fan of. Or they'll hear me talk and somebody will say 'I knew it was you as soon as you talked.' And I get that a lot, which I find bizarre. But yeah, you're right. But listen, that's a good thing to have. Your words that God gives." You’ve had a lot of roles over the years in such TV juggernauts as CSI: NY, Ghost Whisperer, Castle, Bones, but you’ve also done a few UK TV things such as Luther, Pie In The Sky and The Bill - so, what is the difference between doing UK TV over US TV? "Craft Service," Ross quickly answers, barely before the question was finished! "I kinda kid and I kinda don't kid. I grew up in British TV and did a lot of BBC and ITV shows. When I first came to America; and Band of Brothers was different as we shot that in Europe, the first set I was on, the first movie I was in in America was The Polar Express. It was the first time I had shot on a soundstage in LA. And I will never forget walking into the Craft Service truck the first day. It had anything you could want or possibly wish for. And the Friday came around and there was lobster being served! I was used to bacon sandwiches and runny eggs in England. And suddenly I was eating lobster and any flavored gum that I so desired." "And so that was a big deal. Also, the production values are the correct words to throw out there. But listen, the crews in the UK are wonderful, the crews here are wonderful, the actors both sides are great. Everybody creatively is tremendous either side of the pond. So the only thing that it really boils down to is production value. They know how to market a show here and how to make it lovely and glossy." Indeed, your filmography seems littered with one show here, one show there type deals, save for Band of Brothers, Crash and WC. So, are you more suited being a series regular on a TV show or happier being this uber-talented gun for hire, perhaps? "Well, I've done the regular thing for a while on Crash for two years. And that was wonderful. I absolutely enjoyed that. I mean, I think that gun for hire is something that I am very grateful for. A lot of people are very kind and they bring me on on their shows and ask me to be a part of it. And that's a huge compliment. I love doing that." "We had two great years on Crash and some people go five, six or even seven years. And that's a big, big commitment. Although it would be a wonderful commitment, don't get me wrong man. I would really like to drive round the corner to a studio by my house and go to work every day for seven years. That would be wonderful. Having done two years down in New Mexico on Crash it was wonderful and I'd like to have actually done another couple of years." "But also it's a lot of hard work. Which is really what we all want to do. We all just want to work hard. We all want to go to work everyday. I'm really blessed how it all works out for me. I'm usually pretty busy and people are usually very kind. I'm in a happy place and I'm very grateful for it." What is this INNER AUTO MOVIE PROJECT that you are working on? "That's a great movie that we shot last year. Great little cast in that with a lot of faces people will know. We shot that out here in the desert." But what is its actual finished title?! "The title they still haven’t come up with the golden title. So, if anyone out there has a suggestion ping them over to me director 'cause he's still on the fence with a few of them. But it's a wonderful story that follows the story of this guy called Kansas who is driving around and getting himself into all sorts of trouble. And he meets all sorts of vicious characters along the way, of which I am one. It's a great road movie." And then we have IT'S NOT YOU, IT'S ME? "Yeah, I just wrapped two movies recently - that one and THE WILL TO KILL. I shot them back to back. And what was interesting to me was IT'S NOT YOU, IT'S ME is a romantic dramady. And I say that because it's not a romantic comedy, but it's a romantic story abut a boy and a girl breaking up and the voices inside each of their heads kinda of shedding light on how they're feeling. And what they're feeling. And what they should be doing with their lives. It is a great movie with the lovely Joelle Carter, who people will know from Justified." And the comes THE WILL TO KILL? "Yeah, that was also a lot of fun. It's very dark about two Boston detectives chasing down a serial killer<' he laughs. "So I went from a nice romantic drama to playing a Boston detective. Which also stars Sarah Jane Morris, who people will know from Brothers and Sisters." You are now a HUGE Tweeter, my friend! Mostly daily stuff with various photos and quick comments, what has brought you to that world? "The Twitter thing was a suggestion that I do it. I think that social media is something we're all afraid of and that we all secretly hate at the beginning, and then secretly kind of like once we get into it. It took me a while to see what the big view was. Now I find if I don't throw down a quick hello why should people follow and be excited about what you're doing?" "The thing that I really like about Twitter is I think its a modern age fan mail site. Where people used to write letters to your agent and sometimes you could get them and sometimes you didn't, now anybody can write you and say hello. And not everybody can get a reply, but sometimes you can. You can write a quick hello back to somebody and make their day, you know. And that's kind of a cool thing." And it seems there are a few Facebook pages for you too! "Yeah, I have my own personal Facebook page, but I keep that exactly what its meant for - just for family and friends. I know there are a few Facebook sites which I have some involvement in and some I have no involvement in. But I know people spend their time in putting these things up with pictures and stuff. But I'm affiliated with just one of them, and that's about it." You starred as a little Freddie Mercury in Queen's 'The Miracle' video, even performing alongside the man himself at the end of the video! "Yeah," he laughs, "I made my peace with that a long time ago. I think it's a wonderful piece of art, yeah." Do you still have vivid memories of that shoot or is some of it a blur these days? "Well, I do actually. I have really fond memories of it. I definitely remember the shooting schedule being shot over two days. I remember the hotels we aware staying at and meeting the band themselves. The rehearsal process is maybe a little bit more of a daze, but I remember rehearsing with the band and studying the VHS tapes. And jumping around the house with a broomstick like a lunatic. That was my process back then, I guess." And did you get handsomely paid back then? "No, but handsomely for a child, absolutely. It was great. I could go buy clothes and buy my family gifts. So it was great in that sense. But in truth it was child labor," Ross loudly laughs. "But we got a great experience out of it. I actually still have hanging in my house a gold disc that we got as part of the video campaign. It's really lovely. And that's still hanging in the office." "Pretty much every film set that I'm on, even to this day, at some point somebody decides to Google me. And in-between takes I'll hear the opening bars of that song playing, usually from the sound mix desk. But yeah, I've very grateful for it. It brought a lot of joy to people. I can look at it from an outsider now. It was an incredible feat getting that bunch of kids to do that. What a treat. I was very, very lucky." In truth, the internet doesn’t have much, if any meaty gossip on you - or are you simply someone that may play a ruffian on TV, but is a law-abiding pussycat in real life?! "A little of both, Russ. A little of both. I think you can make a choice when you're in this industry on how private you wish to be and wish to remain. Whilst still doing your job. I live a very quiet, peaceful, wonderful home life that nobody needs to know about. Unless you're one of the circle. And I'm happy with that. ",p> "But listen, my crazy years were probably before the internet really started catching on so I really got away with a lot," he laughs. Your main IMDB main photo ... man, you've got some party goin' on with your hair in that shot! "That was a photo shoot I did in New York. 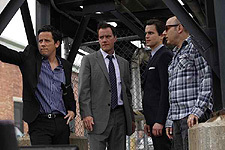 I think it was the first time I did White Collar and we were doing the second season of Crash too. In this wonderful industry when you go for these things there are all sorts of people there waiting for you. There are stylists and make-up people, hair people. And no matter what you do with your hair that morning, somebody's gonna come in and ruffle it up and try to get it a little cool and a little edgy." "And I'm fine with that sometimes and other times I'm like this is barbaric and ridiculous. And so I'm like why don't you just let me put my own hands through my hair. And that's kinda what I did there. And I thought is was really funny." Finally, we here at Exclusive Magazine LOVE penguins, the bird … do you?! "I mean, I have love for wildlife. Hey listen, if I had a penguin beside me in the car I'm not gonna harm it. I'd probably hang out with it and think that he was pretty cool. I love that movie March of The Penguins." So, if he was sitting there alongside you now, what would you name him? "I don't think I would name him. I think the first thing I would do is say Hi, and if he answered back I'd be like 'f**k me, there's a talking penguin in my car'," he laughs. But you'd have to introduce yourself! "I'm sure I would, but they don't have opposable thumbs though. So he wouldn't be shaking my hand," he laughs again, and this time for the last time. 'Serving Up Richard' opens in NYC on Sept. 7 and in LA on Sept. 21, other cities will follow.